When purchasing this product, you get an activation code for the Steam Wallet for $5 (US dollars). If your account is in another currency, the amount of the card will be converted at the current exchange rate. Allows removing limited account status after redeeming this card. 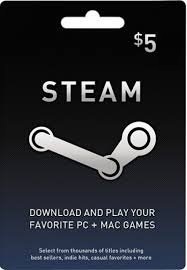 You are purchasing a Steam Wallet card $5. If your account is in a different currency, the value of the card will be converted based on the exchange rate.